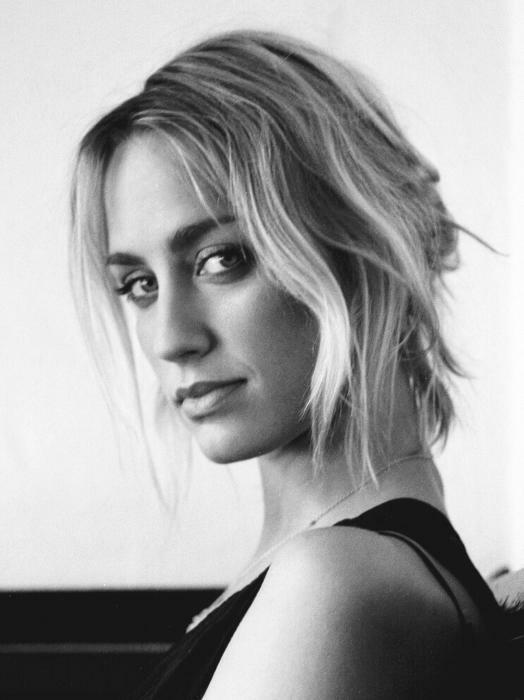 Ruta Gedmintas last appeared on the West End stage as the ”artistic, volatile and passionate” Astrid Kirchherr, in the London West End musical Backbeat at the Duke of York’s Theatre. As well as on stage, Ruta is also forging a successful career in film and on television, where she is probably best known as Frankie in BBC’s drama series Lip Service, and from Showtime’s The Tudors and The Borgias. Earlier this week Ruta took time out to answer some questions about herself and her career. Enjoy! I understand that you have Lithuanian parents. Were you born in Lithuania or the UK? My Father is Lithuanian and my mum is English. I was born in the UK but spent the first few years of my life in Sweden. In England, I grew up mainly in Buckinghamshire. When did you (or someone else) first discover that you had a talent for acting? I had originally wanted to be a dancer but at primary school when I was about 6, I was picked to be in the older years’ play about the Second World War. I had one line, “It’s not our fault the war’s on.” I remember really enjoying pretending to be in an air raid. I don’t think it was a ‘discovery of talent’ so much as a tool to bring me out of my shell by my teacher. I was a very shy child. You graduated from The Drama Centre where you trained under Reuven Adiv. Some great actors were also taught by this inspirational teacher. How would you describe your experience at The Drama Centre? Insane. And remarkable. I spent three years there. The first two in the old Methodist Church in Chalk Farm, training with Reuven among various other inspiring teachers. You were worked incredibly hard. 55-hour weeks (just on timetable), you averaged 3 hours’ sleep a night, and turned a sort of yellow tinge. It was often agonising, painful, and miserable. But what came from it was a huge understanding of yourself, your capabilities, and where you should be aiming for. I was taught by Reuven for the two years before he tragically passed. He was a genius and a guru-like mentor for thousands of actors. He is always in my ear telling me when I am being rubbish. I loved that man. Which of the plays that you performed with The Drama Centre were the most rewarding for you? Spring Awakening was one of the first I did there, directed by Reuven. We spent the entire 4-hour rehearsal on my entrance and first line. It was a 4-hour crash course in what he taught. Place, sense, previous circumstance, relationship, and connection to the past. It was always incredible at Drama Centre when the penny finally dropped. You portrayed the role of Lady Sybil Tenterden in J. M. Barrie’s comedy at the Manchester Royal Exchange. Can you tell us about the play and your character? What Every Woman Knows is a comedy that argues that behind every powerful man, there lies a woman integral to his security and success. Lady Sybil was a flighty dreamer. Bored of her social status and the men that would fuss around her. She became enamoured by politician John Shand, because of his brisk and challenging nature. This was my first play out of Drama School and I got to work with some wonderful actors in a beautiful theatre. I’d love to work there again someday. As well as on stage you are also creating a very successful career on television and film, with one of your most celebrated characters being Frankie, in BBC’s drama Lip Service. How would you describe Frankie and what did you most enjoy about creating the character? Frankie is a very reckless, spontaneous and fiery girl. She has been through an incredible amount of painful experiences in her life, which has left her with a hardened cold and bolshy attitude that hides a very vulnerable little girl underneath. The duality was the hardest and most rewarding thing about playing her. I gather that Lip Service 2 will be back in 2012. Has filming been completed for that and what more can we expect from Frankie? You are currently creating the character of Stuart Sutcliffe’s girlfriend Astrid Kirchherr in Backbeat. How would you describe Astrid? Astrid is artistic, volatile and passionate. She is on the cusp of her adult life and is inspired by everything around her. She is a romantic at heart and has a thirst for creativity in every form. She sees everything in the world as beautiful and progressive, even if it is painful sometimes. How have you researched Astrid and ensured that the character that you portray is accurate to the real Astrid Kirchherr? The play is based on the original Backbeat film, directed by Iain Softley. When researching the film Iain interviewed Astrid and Klaus. I got hold of the transcript of that interview, which was a fantastic starting point. Past that I watched as much as I could, as many interviews with her as I could find, books about that period in Hamburg, films she would have watched, books she would have read, music she listened too. Of course, we had to know that all the background work was there, and then begin our work on the story we are telling. What is it about Stuart that attracts Astrid to him and takes her away from Klaus? Astrid and Klaus had a very loving and comprehensive relationship. They were together for four years and loved each other dearly. They enjoyed a great deal of the same things. They could bounce artistically off each other, and they are still very close even now. But I think for Astrid, Stuart was a type of person she had never encountered before. He had something about him that she couldn’t place, a mystique that drew her to him. The real Astrid said from the moment she saw him that first night in the club, she knew her life was about to change. He was different from everyone she knew. He was an artist, through this insatiable inner need to paint, something so desperately passionate, and on the reverse of that he was incredibly tender and charming with her. She was continually inspired by him, which is important in any relationship. How does your own personality compare to that of Astrid’s? The performances on stage in Backbeat are quite intense. What is it like backstage? While the show is on, it is quite quiet and serene backstage. It takes an incredible amount of energy to do this show, so everybody is trying to conserve energy but 5 minutes after the show or the hour before, it’s mayhem. I think everyone in our cast is a little insane, or eccentric may be a better word. There are continuous pranks and games going on. It is so brilliant being with such a tight ensemble. They really are wonderful. Why should everyone go and see Backbeat? It’s an incredibly fun night out that also sweeps you through a romantic and tragic drama. When I go to the theatre, I want an experience. With our play you feel the rush of being part of the beginnings of an incredible young rock band, you laugh and it moves you. It isn’t a musical and it isn’t solely a play, it is somewhere in the gel between, which is a really exciting place to be. Do you have a preference for acting on stage or in front of a camera? They are both so different. Each have their own draws for me. I just hope I can continue balancing the two. Do you have a role model that you aspire to be like, and if so who? From a young age, I have always loved Joan Allen. I first saw her as Elizabeth Proctor in the film adaptation of The Crucible, which is one of my favourite plays and since have adored her choices in every role. I admire her like I admire Meryl Streep. What is your current favourite TV programme that you like to catch up on? I don’t get a chance to watch a lot of TV so I am a box set girl. I have just finished Curb Your Enthusiasm, which I adore. I am about to start on The Killing. I was a huge Lost and Wire fan. Like your current character Astrid in Backbeat, you are keen on photography. What subject do you most like to photograph and is it more than just a hobby? I always have a camera on me, so I just snap what catches my eye. Most of the time it translates to nothing but sometimes you might catch a moment in someone’s face or in the relationship of people to a place, a snapshot which tells the story of that day. I guess you could call it a hobby but it’s more about a visual journal for me and it’s lovely when you catch someone’s true smile, or a moment of internal thought. My friends always really appreciate those pictures. What do you like to do to chill out? I see my friends and family. It’s not really ‘chilled out’ but playing with my young nieces is the best thing in the world. It resets me. What message would you like to say to your fans/supporters? I feel very lucky and overwhelmed to have any fans/supporters. It means a great deal. The support often means we get things like Lip Service re-commissioned. So a massive thank you. Many thanks Ruta for a fascinating interview! Ruta appeared in a guest lead role on the BBC’s Ripper Street Episode 8 as Clarissa Silver. Ripper Street: A new drama set in the East End of London in 1889 during the aftermath of Jack The Ripper murders. The infamous H Division – the police precinct charged with keeping order in the district of Whitechapel- is in a chaotic state trying to keep order after a tumultuous time for London and reported infamously worldwide. I am a straight ‘older woman’, I’m not a theatregoer, being disabled, so Lip Service is all I know of your work. But I totally fell in love with the character of Frankie. So much so, that having just watched the first episode of Series 2, I was most upset with your hair! Cut it ragged again please! What this has demonstrated to me is what an amazing actress you are to have that effect on someone. I shall be looking out for you on TV now for anything you do. Your skill will surely lead to much more work on TV & I see a very bright future for you. Thank you for the pleasure you have given me; will continue to do as Lip Service continues, much more to come! I am amazed that Ruta has not had bigger roles in the past, her portrayal as Frankie in Lip Service is so finely balanced and for me was the highlight of the series. She manages to make Frankie highly attractive and vulnerable whilst being such a “fuckup”. Frankie could so easily have become a manipulative and really annoyingly self obsessed character, but we were saved from that by Ruta’s brilliant performance. I hope she goes on to an extremely successful career in acting, and many more leading roles. It was so exciting and refreshing to see a really interesting series, full of women and set in a lovely city, I would love to see more of Lip Service, the actors and characters and more of the Glasgow. I thank my lucky stars I stumbled over this series on YouTube, it has two of my favourite things in it; beautiful women and one of the beautiful Scottish cities.